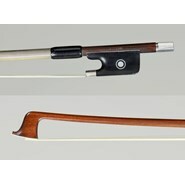 Together with Eugene Sartory, Jules Fetique is considered to be the height of 20th century French bowmaking. Indeed, after studying with C.N. Bazin, Jules worked for Sartory for about 30 years. Jules also worked for the firms Caressa & Francais, Albert Caressa, and his brother, Victor Fetique, among others. Because his work was consistently excellent throughout his career, the French government awarded him with the title, "Un des meilleurs ouvriers de France" in 1927, the highest award for craftsmen. He worked on his own from 1934 until his death in 1951, always maintaining his superb quality. 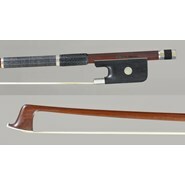 This viola bow is in mint condition, and is an excellent example of his work. At 66.3 grams, it is nimble and strong, drawing a rich viola tone any instrument. Gillet worked for the large Thibouville-Lamy workshop until 1911, after which time he served in the French army. He was wounded in action during World War I. He supplied bows and repairs to various luthiers until 1934 when Eugene Sartory hired him as his assistant. This was very important in his career. Not only was he good enough to be hired by such a great master, but the years of experience working with Sartory helped him improve his craft and gain recognition. After Sartory died in 1946, he worked for Georges Dupuy, Sartory's successor and son-in-law. This bow, typical of his later period, is powerful, yet feels quite light; it is perfect for drawing a big viola sound. The Morizot brothers were remarkably productive, able to make 5 or 6 bows of good quality a day. The five brothers were all trained by their father, Louis Morizot Sr., a student of the great Eugene Sartory. Around 1937 the sons took over control of the workshop, still working alongside their father. 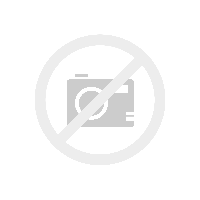 The five brothers worked in an assembly line style, wherein the tasks of roughing out the sticks, making the frogs, finishing and cambering the sticks, were all divided equally. They made bows for various violin makers throughout France and beyond, and many of their bows are branded with the names of these dealer makers. This bow is branded Conet, who was the most important maker in Lyon. Made around 1950, at the height of their abilities, the bow is strong and balanced. It is accompanied by a Millant certificate from 2005. Check out our article on this important maker. Many fine examples both gold and silver mounted. The bow pictured here is one of the fine silver-mounted bows we have available. Morgan won top prize for his violin bow in the prestigious instrument and bow making competition in Paris: The 2011 "Councours de Lutherie Etienne Vatelot". Roger studied with his father, Francois Lotte, and was his assistant from about 1940. He was one of the last of the old guard of French bowmaking, quickly fashioning good playing bows. As a prolific maker, he also supplied bows to notable dealers of his generation, including R&M Millant, Vatelot, and Hilaire. This bow is typical of his work-: Strong, clear, and reliable. Halsey has won several prizes over the years at the VSA, including gold medals in 1992 and 2000, and a certificate of merit as recently as 2012. This bow, which won certificate of merit in 1992 at the VSA, is a superb playing bow that is easy to play, strong and reliable. One of the last bowmakers employed at Hill, Stagg attained a high level of craftsmanship after 6 years with the firm before setting up on his own in 1983. Since setting up on his own he has solidified his sterling reputation and is the author of a detailed expose on bowmaking. This bow is unique in that Stagg made it as a replica of the bows he made for the Hill shop. It is branded with the Hill stamp and his own brand. 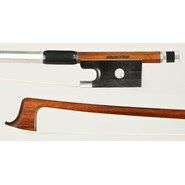 With superb pernambuco, this bow is exceptionally smooth on the strings, and tonally rich and full. One of the finest contemporary Parisian makers, Barthe has won prizes in various competitions, including in 2016 in Paris for a viola bow. After studying violin for several years, Barthe embarked on his bowmaking career at the young age of 16, apprenticing with Gilles Duhuat. He perfected his skills with Stephane Thomachot and Jean-Jacques Millant. Since 1997 he has been working in Paris, where he sought the advice of the inimitable Bernard Millant. Barthe's work is reminiscent of historic French making, yet possesses distinct characteristics all his own. This bow is remarkably responsive and supple, drawing a warm, clean sound. 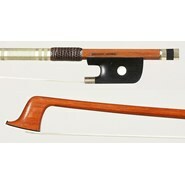 It is excellent for any young musician seeking a fabulous modern bow at a reasonable price. Originally trained as a violist, Barbiero's passion for woodworking led him into bow making. One of the few Italian bow makers of great reputation, he has trained with such masters like Christian Barthe, Nelly Poidevin and Alfredo Clemente. He has made bows for some of the most important musicians of our day. These bows were made for the VSA competitions of 2014 and 2016, and are robust and vibrant, drawing a clear, ringing tone. New York. Beginning on his own in 1978, Aniano continued studying bowmaking with William Salchow in the early 1980s. Since 2002 he has worked with the renowned Yung Chin, whom Aniano considers his principal teacher and mentor. He won prizes at the VSA, including gold medal for a cello bow in 2006 and a viola bow in 2010. This bow is his personal model, inspired by Pajeot. The stick is flexible and strong and draws a clean and focused tone. After training with and working for C.N. Bazin in Mirecourt until 1921, Lotte worked for Cuniot-Hury until 1925. He married into the Ouchard family in 1919, and was the brother-in-law of Emile A. Ouchard. He trained several workers including LaPierre and his son, Roger. 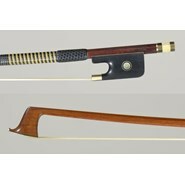 His bows are of a consistently good quality, frequently using excellent wood. This bow is surprisingly lively and strong, perfect for drawing a large viola sound. The Nürnberger family worked in close concert with each other to fashion some of the finest bows in Germany. They maintained a high level of artistry over the course of their prolific oeuvre, frequently working on the Tourte model. With luthiers in the family dating back to the early 18th century, the Nürnbergers flourished as bowmakers beginning in the late 19th century, widely recognized as the standard bearers of German bow making. This bow was made c. 1910 and has all the features that made their bows so popular for much of the 20th century- the workmanship is near perfect, the balance superb and the tone rich. One of the best Brazilian bowmakers on the market, De Mattos studied with Christian Barthe in Paris before returning to his native Rio De Janeiro. In essence a French bowmaker, he draws up a new head model with each bow. 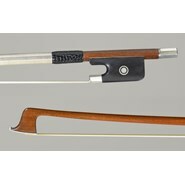 This bow is perfect for any musician seeking a fantastic bow at a reasonable price. It is quick across the strings and well balanced to handle any bowing technique. From a long line of bowmakers living in Schönbach/Luby, Rudolf studied in the state run technical and business schools before emigrating to West Germany in 1964. He eventually worked with Siegfried Finkel until 1973, when he set up on his own in Bubenreuth. In the 1980s he won several prizes at competitions, including the VSA and Wiesbaden.